Grab the best deals on Doha flights from India. Call 0124 416 3000 and book now! 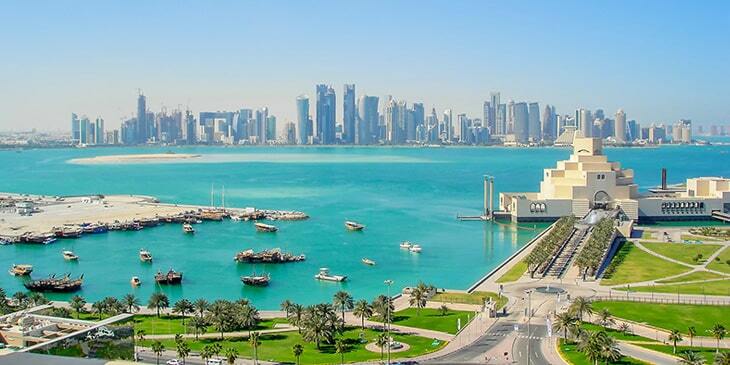 Doha is the most dynamic city in the Persian Gulf offering lots of diversity to its visitors; from desert landscapes and traditional souks to a glittering skyline, modern shopping malls, luxury hotels and world-class restaurants. This capital city of Qatar boasts several historical edifices; the most prominent among them is the Imam Muhammad ibn Abd Al Wahhab Mosque, featuring 93 large domes, sandstone facades and a blend of traditional Arabic and modern architecture. The Umm Salal Mohammed Fort is another site worth visiting, with an impressive facade and thick walls built during the reign of Sheikh Mohammed bin Jasim. Doha also offers lots of outdoor attractions to its visitors; you can ride a camel in Mesaieed, visit the Al Thakira Mangroves to spot the likes of herons and flamingos and stroll around Souq Waqif to browse a variety of products, from clothing and handicrafts to local spices and souvenirs. Book cheap air tickets to Doha from India through Brightsun Travel and have a joyful experience by travelling to this amazing country. With various state-of-the-art museums, Doha has emerged as the country’s main centre for art and culture. There is so much to explore here; step inside the world-class Museum of Islamic Art to discover an excellent collection of ceramics, textiles, paintings, manuscripts, jewellery and precious stones. Visit the Sheikh Faisal Bin Qassim Al Thani Museum and admire more than 600 vintage cars, trucks and ceremonial limousines. Spend time at the National Museum of Qatar to learn about the ancestors of the country and browse a range of rare ancient weapons, pictures, furnishings, and digital models of old vessels. Then there’s the Photography Museum where you can witness a wide collection of more than 15,000 items including historic photographs, documents, cameras and accessories. The Weaponry Museum is another captivating museum in Doha, allowing you to explore a wide range of firearms, swords, and daggers. Brightsun Travel offers direct flights to Doha from India, so you can plan an exciting trip here and experience the city’s captivating museums.